On Friday the Minneapolis City Council voted to allow the owner of the Healy House (built in 1893 and named after its master builder) to demolish it and sell to developers who plan to replace it with a four story apartment building. Last May, the City Council voted 5-0 to save the house from being demolished. But elections took place and new City Council members replaced the existing members resulting in a turn-around and Friday's reversal vote. I caught wind of the new vote last week and sent off a short email to City Council members expressing my support of saving the house. The vote wasn't much of surprise. I sent of an email to the Council using a line from Joni Mitchell's song A Big Yellow Taxi- "They paved paradise and put up a parking lot." It is just more of the same of what we have been seeing in Minneapolis - tear down the old and put up new McMansions (or the apartment equivalent). This morning I received a response to my email from my City Council representative. He provided a lengthy and fairly reasonable explanation for his vote. I just wanted to share with you that the City Council voted to not force the owner to save the house, but we certainly did not order and are not even remotely recommending that it be torn down and have not approved anything else to be built in its place..........What we learned today is that a majority of Council Members were convinced that we did not have the legal authority to restrict this property owner’s rights in this regard. To preserve future homes it would be beneficial to first get them designated as a local, state or nationally designated historic resource. If that had been the case here, we would have had the authority to order the house not to be demolished if there was a reasonable reuse alternative to demolition and it was not a safety hazard. I do recognize the validity of everything he says in his email. On this topic I am very torn. I am very much against almost every instance of eminent domain and I also do not want my government dictating how I live my life. But then there is the history of the city that is being demolished at an alarming rate. Entire blocks trashed as one or two homeowners decide to demolish their vintage house. I currently live in SE Minneapolis (in your Ward). I am working to restore a 1920's vintage bungalow. My house has no notable architect, but as I have dug into history it does have an exciting history as do many of the houses in SE. 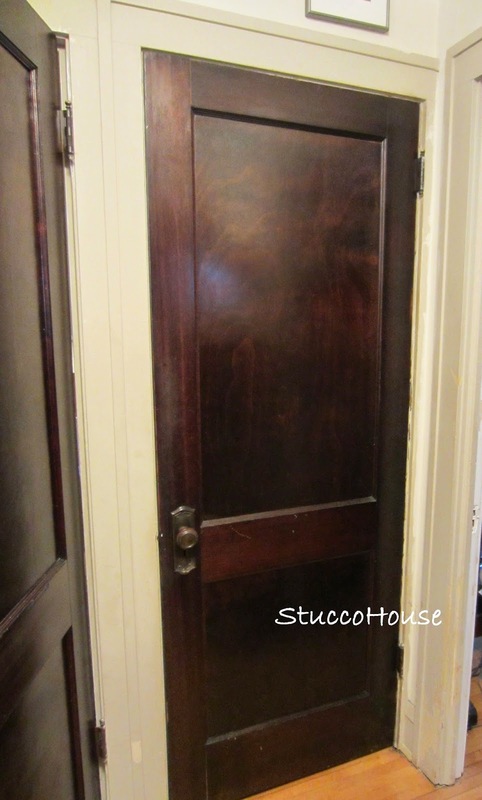 It has old growth oak and maple woodwork that is too hard to even drill through, it has a vintage door that once took ice delivery, that plaster walls keep it warm in the winter and cool in the summer. There is a tree in my yard that is most likely 100+ years old. It was owned by families who worked on the river and then in the Ford plant. Owners of houses that want them demolished will often make the claim that restoration is not worth it or too expensive. As one who is fully restoring a house in my free time, I can assure you this is not true. Granted it is less of hassle to just knock it down. I once lived in Uptown. I had originally moved to the area specifically to live in a 1920'sapartment building off of The Mall. It was a neighborhood filled with history, where one could walk and bike almost everywhere. Suddenly, all that disappeared at an alarming rate as developers started snatching up properties, knocking them down and putting up huge, charmless apartment buildings. One day I was almost run over on my bike by a car racing down Lake street and I realized I no longer wanted to live there. The blocks were filled with huge new apartment buildings and the traffic was terrible as people raced in and out of the neighborhood. Everything that once drew people to Uptown had virtually disappeared. I can't even drive through Uptown anymore. It is depressing. I then moved to Linden Hills and purchased a charming 1920's condo. The neighborhood was filled with vintage houses in need of minor repair and oozed charm. I lived in the neighborhood for 11 years and one day woke up to find that the neighborhood houses (we are talking large, well maintained vintage houses) were being knocked down by developers and were being replaced with HUGE McMansions that filled every inch of the city lot. Traffic also became terrible. People wanted to live in Linden Hills, but this new breed didn't want to live in the vintage houses that once made Linden Hills popular. They wanted new, huge suburb houses. What they didn't realize is that they were stripping the neighborhood of everything that had once made it a great place to live. Once again, I realized this was a place I no longer wanted to live in. I moved to SE Minneapolis. Thankfully this neighborhood has largely been left intact. The lots are really too small to build a proper McMansion (although some appear to be trying) and the neighborhood doesn't have the prestige to attract the big developers en mass. Yet. So, I am left to restore the solid oak and birch woodwork in my house in peace. If what I witnessed in Uptown and Linden Hills starts happening here, I will immediately move. This time I will move out of Minneapolis. You can reason however you want about property owner rights. And I don't totally disagree with you. But, how can the rights of one owner that is hell-bent on demolishing a historic house outweigh those of the remaining neighbors that want the historic value of their back and neighborhood to be retained? Each time I moved in the past 25+ years, it has been because of the "rights" of another home owner that disregarded history. What I usually find, is that the individual that tears down the house then moves on. So, they don't face the ramifications of what they have done to the neighborhood or city. They take their money and run. If this continues, you will lose the charm and the essence of what makes Minneapolis, Minneapolis. And by then it will be too late. Developers will have made their money and moved on.....and the home owners that once valued the history of the city will have moved on to other towns. You will be left with a city of new, charmless McMansions and no memory of the past. No one will remember when homes contained old growth wood woodwork, had ice doors, stained glass windows, hand crafted plaster walls, were designed by prominent architects and lived in by the pioneers of Minnesota. There are many people living in the city who silently are watching all this play out just like me. Last weekend I got a note from one of my Twitter pals over at Hirshfield's (my paint store) asking me if I could use a ticket to Junk Bonanza. They had an extra one. I told them that I would love to put the extra ticket to use. 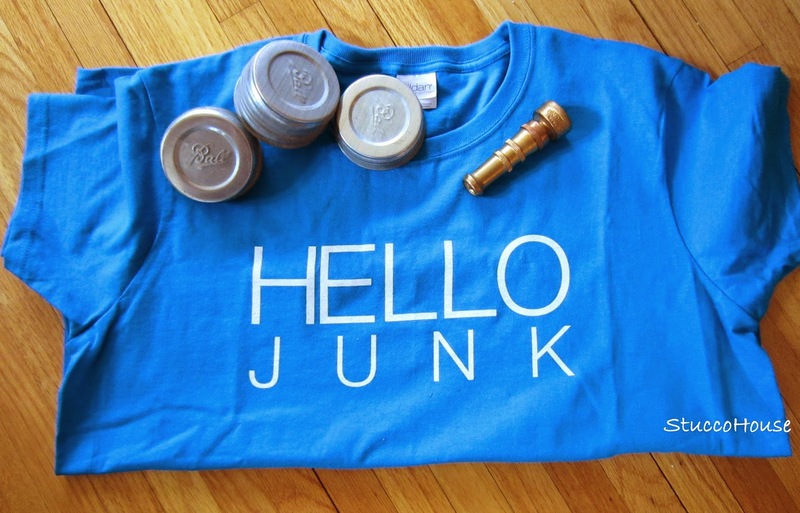 So, last Friday I buzzed down to Canterbury Park to check out the junk vendors. I'm not a big buyer at these sales, but I love to look at all of the vintage merchandise and talk to the vendors. The people watching is also pretty spectacular. I did manage to pick up a few items including some vintage zinc canning jar lids (I use them for storage in my kitchen) and a very cool brass garden hose sprayer ($5). I drove up my back alley this afternoon to drop off two bags of recycling that were in the back seat of my car (It's been a long, hard winter here in MN that has necessitated driving trash and recycling to my back alley bins). 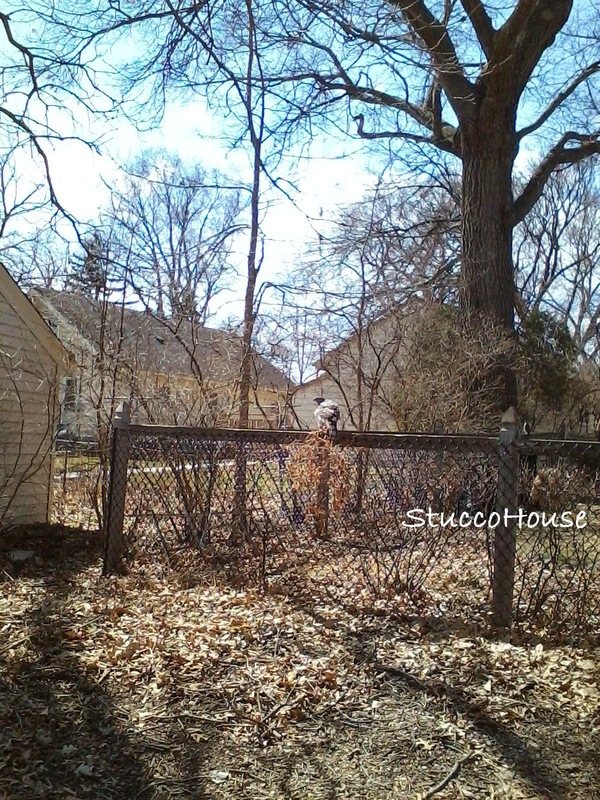 Anywho, I was hauling the bags to the recycling bin when I spotted a huge bird sitting on my fence. I've never seen such a large bird anywhere in my neighborhood. I ran back to my car and got out my cell phone and took a photo. I was a little scared of the thing, so I wasn't able to get close enough to take a really good picture. It took one look at me and immediately dismissed me as a threat and went back to pulling on the clematis vine in my fence. Evidently it wasn't only me that found this bird scary. I watched a usually brazen squirrel slowly back away from the bird with its head and tail down. I'm not exactly certain what is going on with this recent influx of wildlife into my city yard. My bird knowledge is limited to identifying an eagle, a blue bird, a crow and possibly a cardinal. But, one of my tweeps suggested that it could be a peregrine falcon and provided this link which seems to support the possibility. What do you think? Falcon? Nothing too exciting in this post. I've written about the doors in my hallway before. Every year about this time, I put another coat of tung oil finish (which is bit of a misnomer because most of this finish these days is really wipe-on varnish with no tung oil in it at all, but I digress). My goal is to slowly build up the finish on these doors to a nice, soft glow. 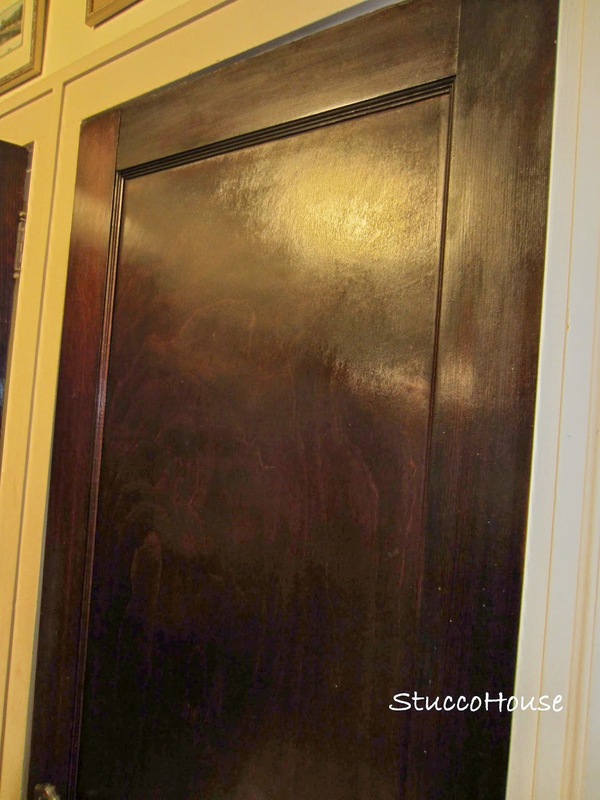 In past years, I had put a coat on both sides of the doors in the hallway except for two of the doors - one going downstairs and the other upstairs. This year, I added the outside face of door going upstairs. This means I spent time painstakingly scraping off paint drops and then filling in and light spots with a Sharpie. I then put on one coat of the finish. 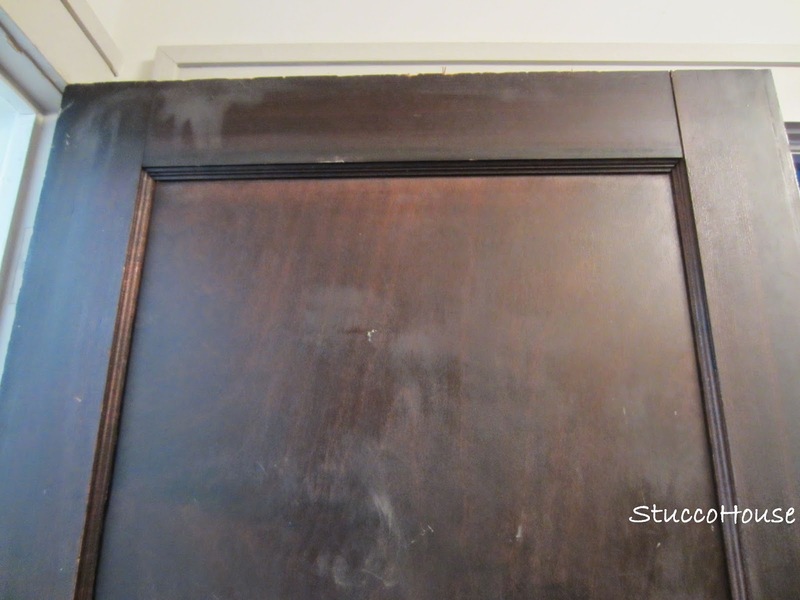 Because the finish had almost totally worn off of these doors over the years, the first coat disappeared into the wood immediately. It will take many more coats before I starts forming a surface layer. You an now see the nice glow from the finish that is developing. The color of the doors looks so much more rich now and the grain is really pretty. Who knew? Here is the door that I focused on this year. You can tell there is almost no original finish left.